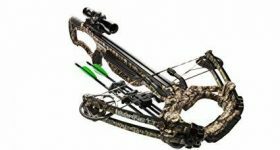 In the past, Barnett reserved the patented step-through riser only for its elite crossbows, but, more recently, the company started to improve other models that are not necessarily part of some flagship lineup. That’s good news for hunters who want to benefit from advanced technologies in crossbows that do not come with a premium price tag. The Barnett Whitetail Pro STR is one of the models the company now offers in this configuration. Many improvements are employed on this crossbow, as well. The adjustable stock and the Picatinny rail are just two of them. Barnett is a company with more than 50 years of experience in making hunting equipment, and there should be no wonder that the Barnett Whitetail Pro STR is an example of the dedication invested over the decades into creating sturdy crossbows that hunters will appreciate. A piece of marvelous engineering, this model is built with durability in mind. Be aware that the high-quality components make this crossbow not precisely the most lightweight on the market. Still, at 6.9 lbs, it is even more convenient than many other models on the market. Another advantage is that the build of this crossbow makes it an excellent choice for any type of hunter. Seeing that you don’t have to worry about carrying a lot of extra weight, you might find it a good pick for the times when you need to navigate cramped places to get a good shot at your prey. Capable of speeds of up to 400 fps, the Barnett Whitetail Pro STR is not a model to take lightly. The 165 draw weight and the kinetic energy of 140 ft-lbs will tell you how powerful this crossbow is right away. One of the most important things that can be said about the design of this model is the fact that it is balanced, which makes it more comfortable to use. The weight is shifted from the riser to the stock to ensure extra stability when taking shots. Overall, the accuracy is impacted positively, too, by these elements of design. The TRUBark HD camo pattern will help you remain concealed in the woods, while your prey gets closer, utterly unaware of your presence. 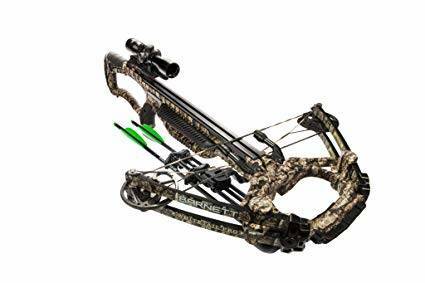 There are various features on this model that make it such an excellent option for someone who is looking for a crossbow that is easy and straightforward to use. For instance, the arrow retainer system is a big plus. It consists of a self-adjusting bristle system that will ensure that your arrows don’t drift away when you shoot. Also, present on this model are three Picatinny rails, which means that adding accessories to this model is a breeze. That is often considered a significant plus by hunters because they want the freedom to add the extras they deem necessary on their setup. You will appreciate the fact that there is a 4×32 multi-reticle scope installed on the crossbow, which means that you will not have to spend extra money on it. The crank-cocking feature is an added advantage for the simple fact that it will save you time and energy. As long as such features work well, you will discover that it is not particularly challenging to use a crossbow that has specific demands from the physical form of the user. Many other accessories will make your day when you open the package. For instance, you get a quiver that can be side-mounted, as well as two Headhunter arrows. As you can see, whether you need to practice, or you plan a hunting trip anytime soon, you can count on this kit to be exactly what you need. Let’s not forget about the technology that makes this model stand head and shoulders above the competition. The Trigger Tech system ensures that you don’t have to worry about dry shots anymore. The frictionless release feature also contributes to the smoothness of operation, and overall, you will find it a real pleasure to use this bow. Your crossbow, no matter how great, needs to be silent to be effective. Releasing a single shot, regardless of whether it meets its target or not, will raise a ruckus in the forest. All the prey within your range might catch wind that something is afoot and run away. So, you must take full advantage of the string dampeners that are included with the package you get if you purchase the Barnett Whitetail Pro STR. You will benefit from more than decent sound reduction, and that, in turn, will help you to remain concealed from the wild animals roaming around. Decently priced compared to other crossbows that deliver similar performance, the Barnett Whitetail Pro STR is a good option for any hunter who wants to hunt deer. Due to its high speed and accuracy, you are sure to land successful shots at your target, and seeing that you get all the needed assistance for cocking your bow, you will find it quite manageable and comfortable to use. Using various technologies for reducing dry fires and noise, it is a dependable weapon that will not give away your location. Since it is lightweight, it is a good pick for any hunter.